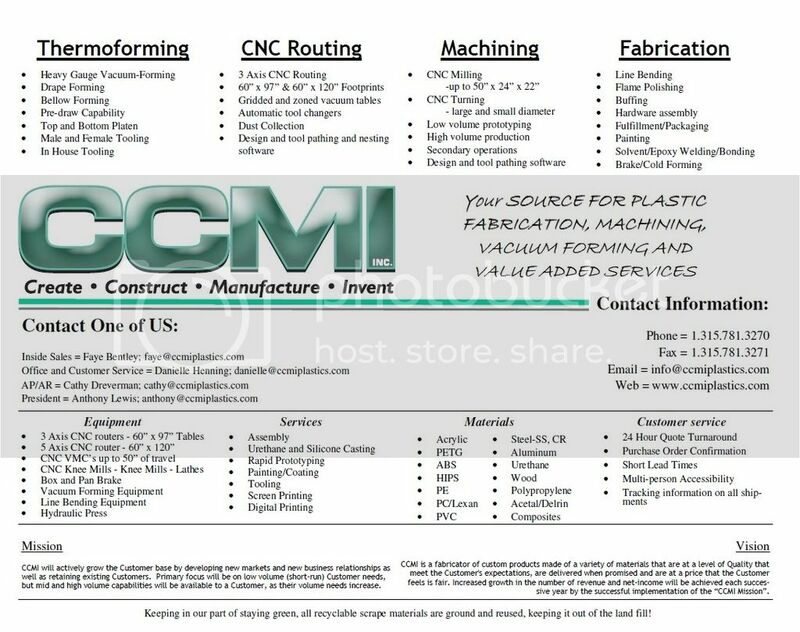 CCMI, Inc is a source for plastic fabrication, machining, and cut sheet heavy gauge thermoforming, and value added services. We not only work with most plastics, we are able to work with a variety materials like steel-SS, CR, Aluminum, Wood, Solid Surfaces to name a few. CCMI vision is a fabricator of custom products made of a variety of materials that are at a level of Quality that meet the Customer's expectations, are delivered when promised and are at a price that the Customer feels is fair. Increased growth in the number of revenue and net-income will be achieved each successive year by the successful implementation of the “CCMI Mission”. CCMI mission is to actively grow the Customer base by developing new markets and new business relationships as well as retaining existing Customers. Primary focus will be on low volume (short-run) Customer needs, but mid and high volume capabilities will be available to a Customer, as their volume needs increase.